Hi there welcome back to Cards by Kay ! This week over at Left of Centre Challenges the theme is Music Makes the World go round ! But I have decide to go Left of Centre for this challenge as I found this image and I couldn't resist I just had to color it and turn it into something ! This is a Sweet Pea Stamps image by the wonderful artisit Enys Guerreo I have so enjoyed doing this piece up. I have covered the front of a note pad just a simple project but the image is so detailed and tells a story in itself that I wanted to show the image not what's around it ! So I have taken a simple note pad and covered the front with a piece of black card and layered that with paper from Bo Bunny's Somewhere in Time collection, the flower is from Petaloo there is a small ribbon Rose one one side and a small black skull on the other , 3 stick on black gems in the bottom corner. I really loved playing with this image you can find this and so many more images over at Sweet Pea stapms with so many wonderful artisit to choose from the options are endless ! 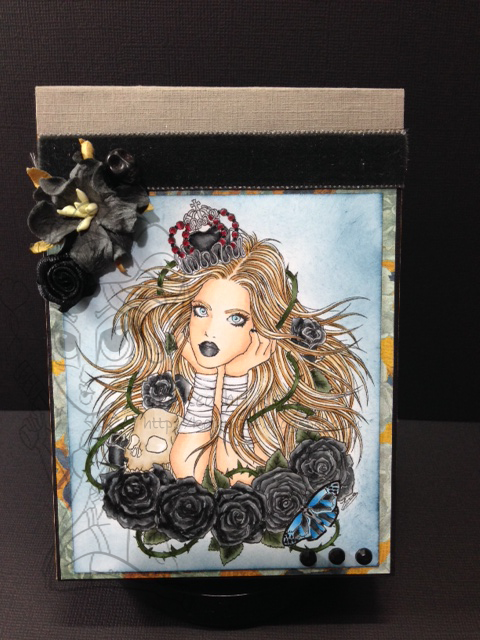 Something Sweetly Dark at Simply Betty stamps ! Anything Goes but make it Dark ! Anything Goes at The Stamping Chef !